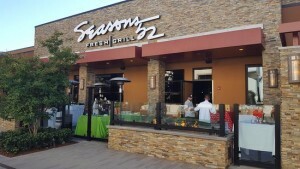 This new restaurant, open for less than a week in Coronado Center, is where Wayne Scheiner and I ate lunch yesterday. It is a striking restaurant, very open, with a huge 360 degrees bar, and we were dining while seated on small sofas. I had a flatbread sandwich, Crispy Braised Short Rib, and the filling also contained cheddar, pickled red onion, golden beets, and horseradish crema with an, au jus dip. My side was their house-made potato salad with bacon. Wayne couldn’t resist the Lump Crab Cake Sandwich Maryland-style, with lettuce, tomato, and mustard sauce on a brioche bun, with a side of asparagus soup.